Sparkling Strawberry Lime Soda + PurelyFresh $180 Giveaway! 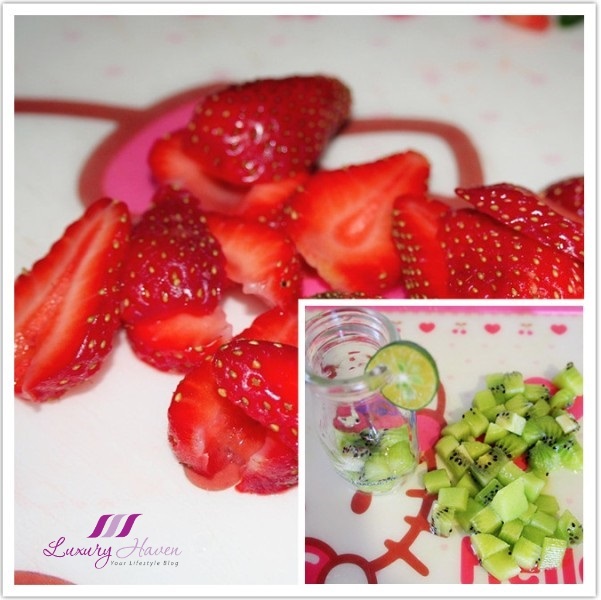 You are here:Home » Recipes » Sparkling Strawberry Lime Soda + PurelyFresh $180 Giveaway! Beat the heat with this uplifting Strawberry Lime Cooler and let it fizzes up your day with every refreshing sip. Sweet and sourish, this Fruity Sparkling Strawberry Lime Soda is so addictive you just can't get enough! 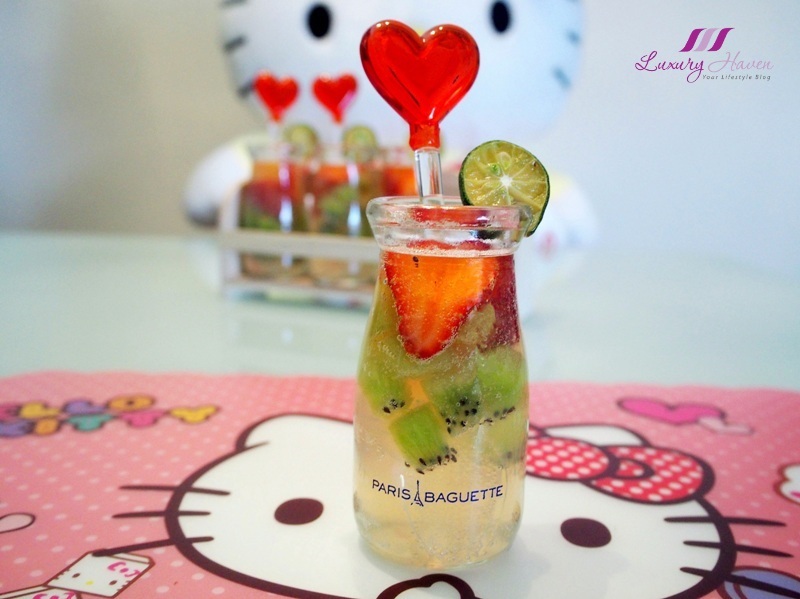 This is a perfect bubbly concoction for home parties or any gatherings with friends. The revitalizing mocktail is your ideal partner on steamy summer days and nights when the weather gets terribly hot. Let's learn how to prepare this tasty Lime Cooler today! Plus, save more money on your grocery shopping by walking away with one of the $60 PurelyFresh Credits that comes with Free Delivery! We have 3 to give away! During one of my grocery shopping at #PurelyFresh, I found this Suntisuk Nammanaw Lime Juice ( 酸柑汁 ) and ordered a bottle to try. The lime juice blends delightfully well with Strawberries and Kiwis, and I turned it into a non-alcoholic Spritzer with just a touch of Soda Water and Sugar Syrup! If you are a fan of Paris Baguette's Royal Pudding like me, save up those glass bottles and recycle them! I became a huge fan of their Chocolate, Mango and Original Custard after one of my son's friends bought them for my family, and I would buy few bottles home each time I visit since then. Slowly, I started collected the empty bottles cause I found it a waste to throw them away. Isn't it cute serving your drinks in these pretty bottles? Melt sugar in hot water and set aside. 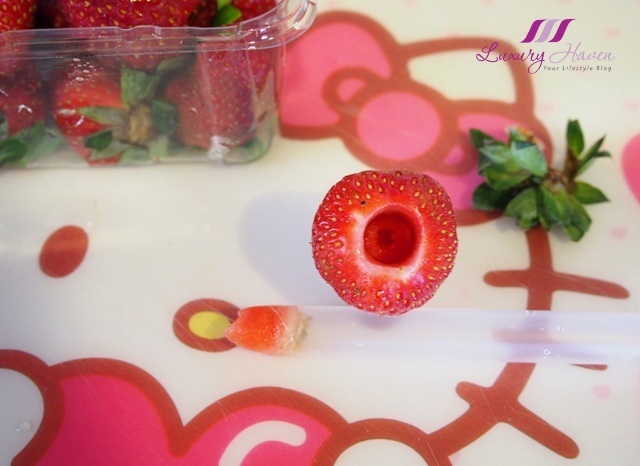 Pit the strawberries easily by using a straw. Cut up the fruits and put into serving glasses. Mix sugar syrup, lime juice and soda. 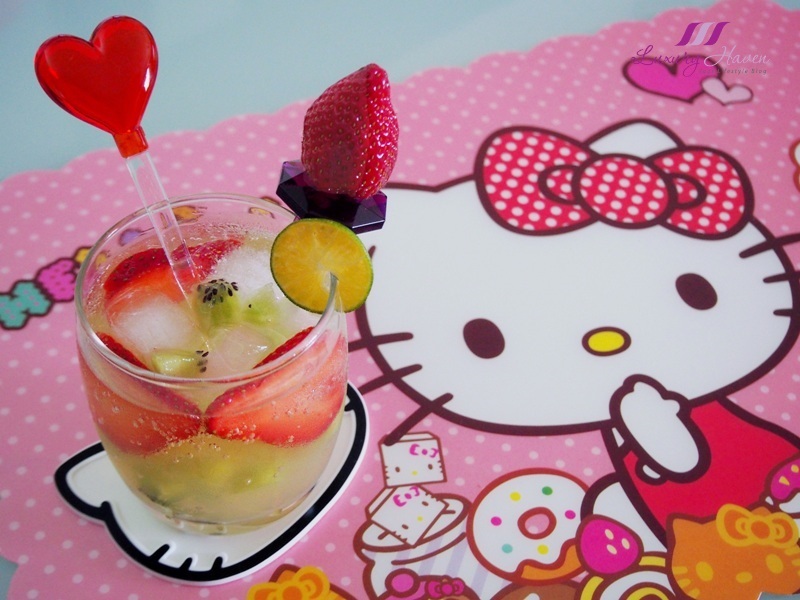 Add ice cubes and enjoy your Sparkling Strawberry Lime Soda! 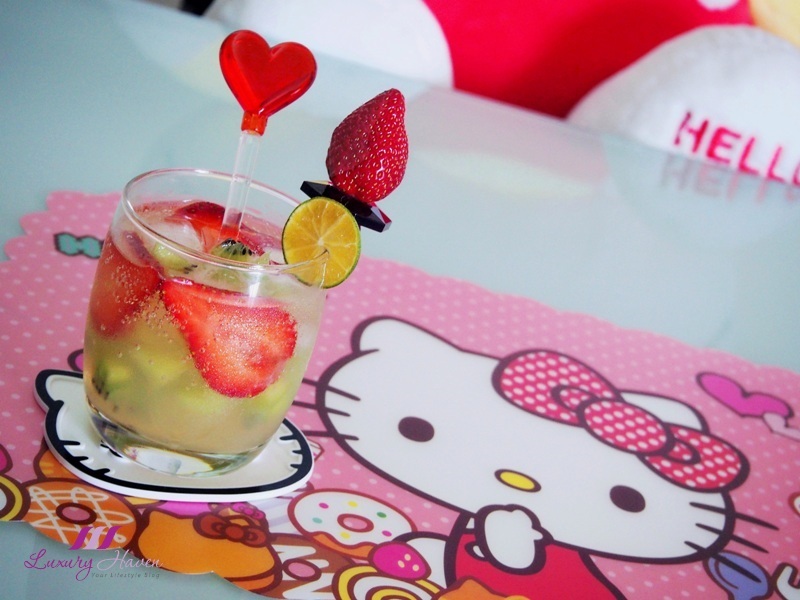 Would you like to join #HelloKitty for a drink? 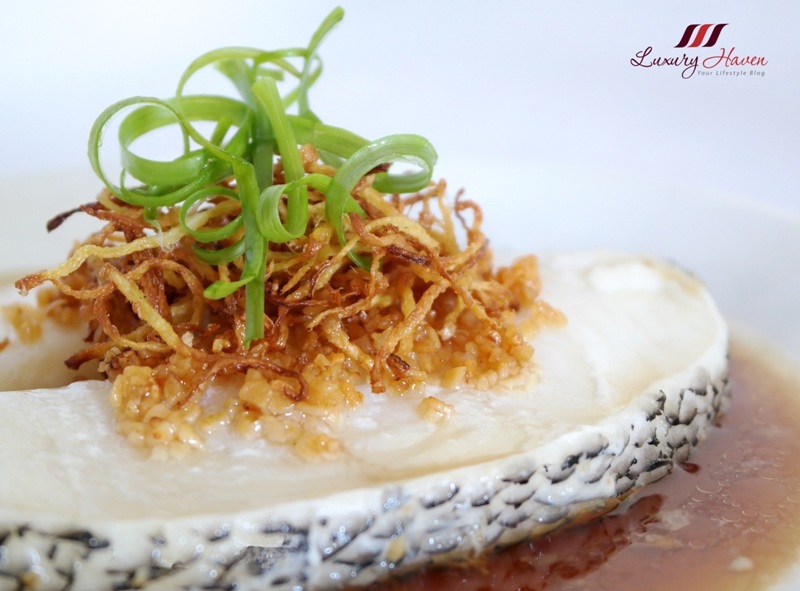 This October, we are giving away shopping credits for you to buy your groceries like fresh Norwegian Cod Fish to cook up a storm. 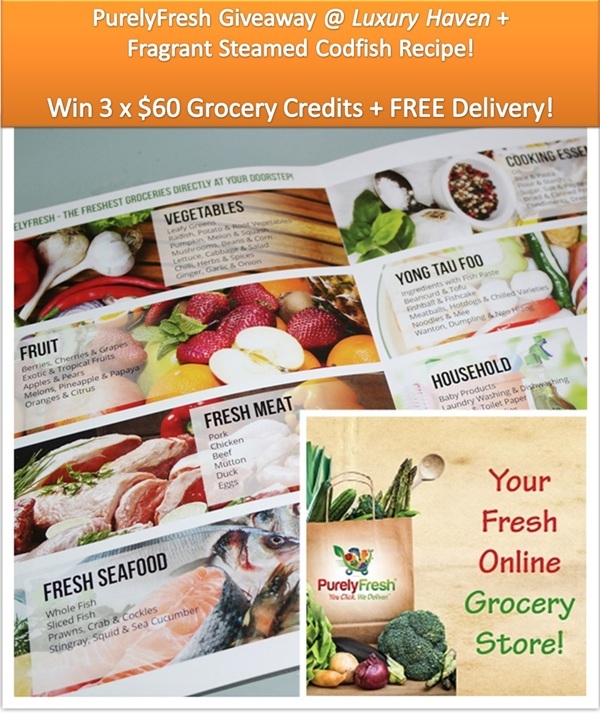 Hop over to PurelyFresh Giveaway to Win 3 x $60 Grocery Credits now, and be one of the lucky 3 readers to go on a shopping spree with us! 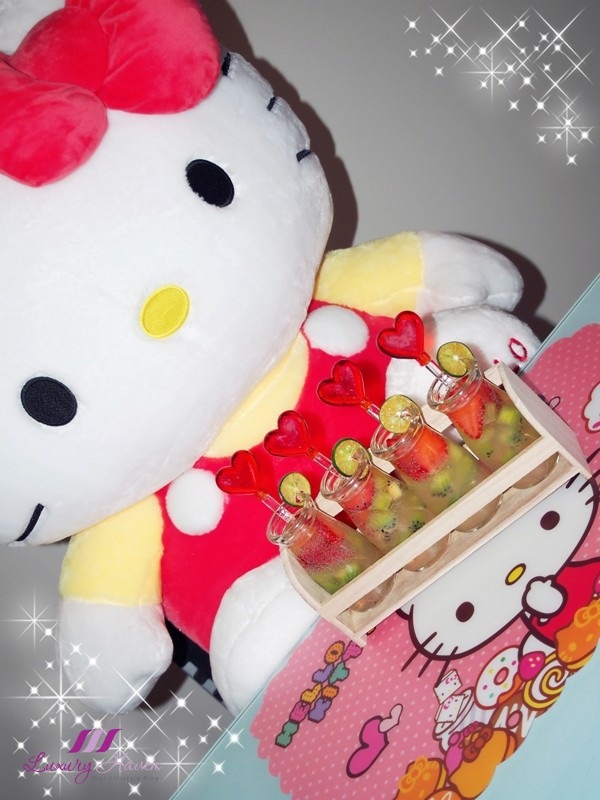 The drink sounds so refreshing and your display with hello kitty I love. Delicious! I wish I could taste that lime juice. Have a great week! These mini bottles are delicious, you can always make stunning presentations dear. I like lime juice but hadn't thought of adding soda drinks to mix with it..should be sparkling fresh..
Looks soo yummy =) Really liked the post! What a lovely, refreshing drink!!! The drink looks yummy and delicious but since I'm on some rather tight diet, would like to know if it'll work without the sugar? Beautiful presentation , I will try it. Oh, need one of this now!!! 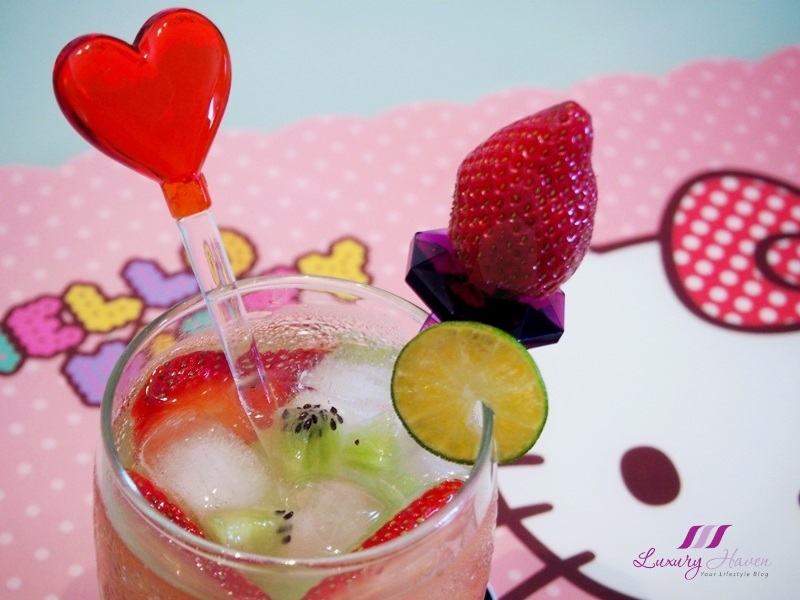 what a cute drink! 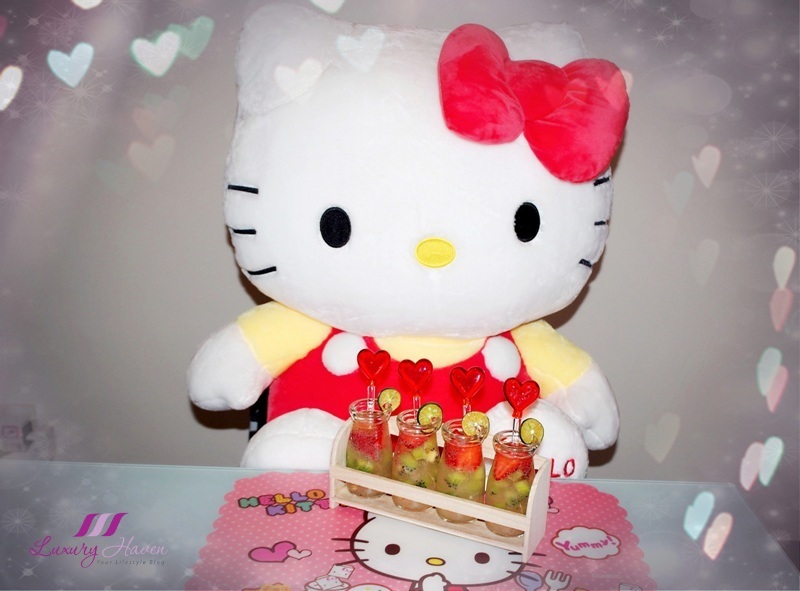 Love the hello kitty theme! you always have great ideas. So cute and everything looks so yummy! 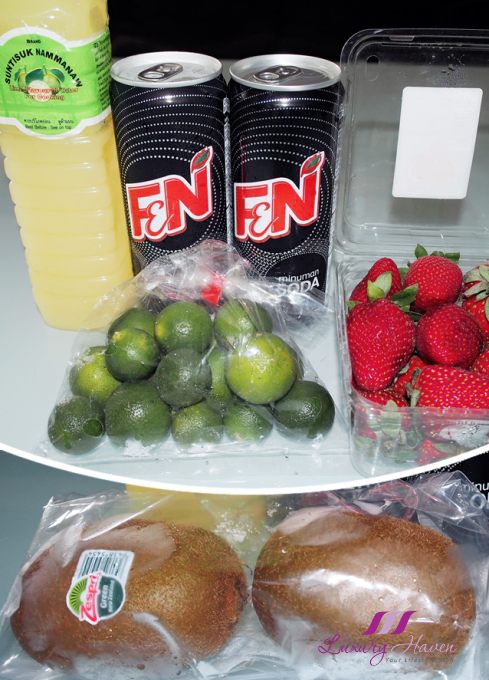 Umm que maravilla de refrescos tienen que estar deliciosos. Pretty, pretty, pretty!! I feel so happy looking at the drink. And best of luck to the winners. Ok yummy!! It looks really delicious! Thanks for sharing!! I love those little milk bottles. You've done well to keep them Shirley. It's super hot in Melbourne today and this drink would be ideal right now. 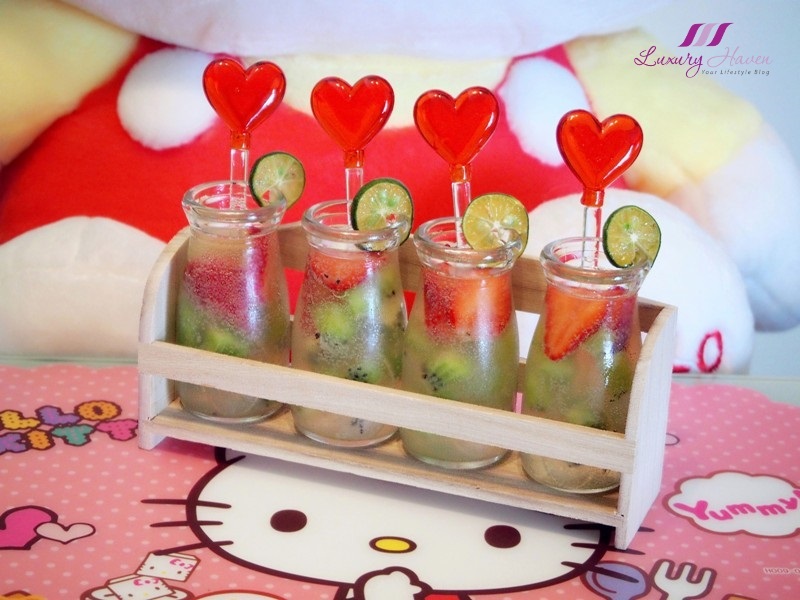 I love to eat strawberry and kiwi and love to drink lime juice so this drink sounds so refreshing and just right for me. That looks delicious! Amazing pictures!